We are delighted to be participating again in DIY, Live Art Development Agency's Professional development projects led BY artists FOR artists. 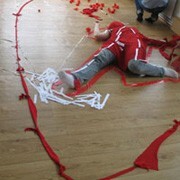 Deadline for DIY8 proposals: 5pm Thursday 19th May 2011. Guidelines are available in large print on request. DIY is an opportunity for artists working in Live Art to conceive and run unusual training and professional development projects for other artists. We want to hear from you if have an idea for an exciting, innovative and idiosyncratic Live Art professional development project that offers something new and is geared to the eclectic and often unusual needs of artists whose practices are grounded in challenging and unconventional approaches, forms and concepts. If you think you can initiate and run a DIY professional development project then download the guidelines or visit the website below. DIY 8 is a Live Art Development Agency initiative developed in collaboration with Artsadmin (national), Fierce (West Midlands), Live at LICA/Nuffield Theatre Lancaster (North West), PLATFORM (national), Text Festival (North West), Whitstable Biennale (South East) and Yorkshire Sculpture Park (Yorkshire). We are planning to support nine DIY projects that will take place sometime between August and October 2011. Each project will receive Ј1,000 support.